The Handbook on Germany’s European Policy is published in times of multiple crises, rising skepticism, and concerns about Germany’s ties with the European Union. In this context, it emphasizes the importance of European integration and the political and economic benefits Germany gains from its EU membership. Furthermore, the texts illustrate Germany’s great impact on shaping the European integration process and the EU’s policy-making processes. 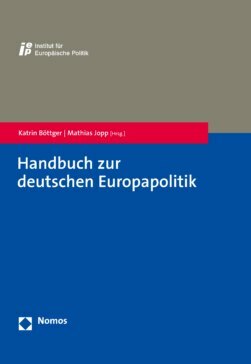 In this unique handbook, 38 authors analyse Germany’s European Policy, its broad parameters, and basic concepts in important EU policy fields, as well as Germany’s domestic determinants, actors and most important bilateral relations with other EU member states. Therefore, this handbook will be a helpful guide for anyone who deals with various aspects of Germany’s European Policy in academic, political or practical ways. Comprehensive chronicle of the German European Policy since 1946. Gabriele Abels, Peter Becker, Timm Beichelt, Ansgar Belke, Katrin Böttger, Christian Calliess, Christian Dreger, Henrik Enderlein, Severin Fischer, Katharina Gnath, Daniel Göler, Ines Hartwig, Martin Große-Hüttmann, Jörg Haas, Sven Hölscheidt, Rudolf Hrbek, Helge Jörgens, Mathias Jopp, Annette Jünemann, Henning Klodt, Wilhelm Knelangen, Michael Kreile, Ulrich Krotz, Agnieszka Lada, Barbara Lippert, Andreas Maurer, Stormy-Annika Mildner, Almut Möller, Gisela Müller-Brandeck-Bocquet, Oskar Niedermayer, Hans-Wolfgang Platzer, René Repasi, Barbara Saerbeck, Joachim Schild, Cara Catharina Stauß, Roland Sturm, Funda Tekin, and Thomas von Winter. The handbook on Germany’s European Policy is supported by Germany’s Federal Foreign Office.